Where do I find info on these brutes I got!!!!? ?!!!!! What do you want to know? One source might be the catalog thread. I think they came pout around 1974. Nothing in the catalog thread. If you search for 2115H there is only one other hit on an old old thread posted by a guy who hasn't been here in many years. Well, then, maybe it's up to us. Danospamo, what do you wnat to know? Well, here's what I can remember, for what it's worth. The 215SH (not 2115H, unless we're talking about a different cabinet) is Sunn's 'other' folded horn cabinet, the better-known one being the 118VH, which came with a Cerwin-Vega 18" driver installed. The 215SH came stock with two 15" Sunn Transducers, 8 ohms each, for a 4 ohm total impedance. It may also have been available with Sunn Magna drivers as the 215MH. The Sunn Transducers were rated at 80 watts RMS, so figure 160 for the cabinet, 150 to be conservative. That doesn't sound like much these days, but was typical back then. Power was expensive, and you didn't find many amps over 150W. The idea behond the folded horn was to make up for that by making a more efficient speaker and, in that, I think Sunn succeeded. Both of their folded horn cabs were very loud on low power. As I'm sure you know, they're heavy. The conventional 215S was heavy, but the 215SH is a slightly larger cab and has the internal baffling making up the horn path. How do they sound? Well, horns have certain characteristics. They trade off bandwidth for efficiency. You won't get much in the way of highs out of these, or any similar cabinet. Horns also have a low frequency cutoff, so the really low lows get lost, but that's true of most bass cabinets, anyway. What you do get is a lot of high bass and low midrange, which is typically what people want from a bass cabinet. These deliver. They're a bit lacking from a hi-fi standpoint, but that's not what they were designed for. The horn path is too short for high fidelity reproduction, and the horn mouth is too small. If you have two of them, using them together will lower the low frequency cutoff by making an effectively larger mouth. If you have (or are using) only one, then it's best to lay it on its side, with the opening on the bottom. The horn flare rising up from the floor will incorporate the floor as part of the horn and effectively increase the size of the mouth, giving better low end production. Unless, of course, you try that and don't like the way it sounds. After all, it's all about what gives us the sound we want, right? Another thing which is true for all similar cabinets - all bass cabinets, really, but more so for horns - is that what you hear on stage is not what your audience will hear. 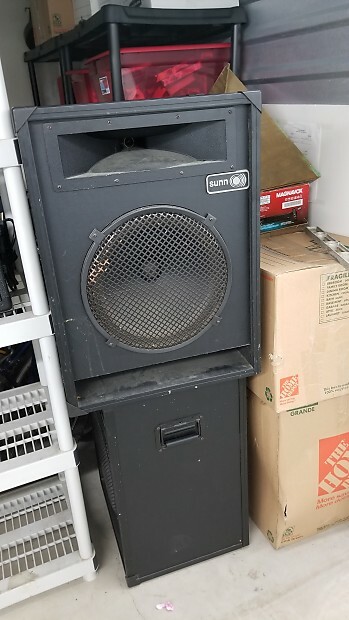 All large speakers have a characteristic called beaming, in which higher frequencies have poorer dispersion than lows, so when the bass player is standing in front of the cabinet, all he hears is the thump, with little or none of the high mids and treble that give the sound definition. Get out in front of the cab, though, and everything changes. The mids and highs are there. With horns, that's even more so. The horns reduce the dispersion even more, so the bass player and the band often can't hear the bass very well, while the crowd is being blasted. Some say that the bass is louder ten or fifteen feet away than it is right in front of the cabinet. I don't think that's physically possible, but, because of the controlled dispersion, I can see why it seems that way. How much are they worth? We have a saying around here. They're worth as much as someone will pay for them. They're fairly rare, but that just means that you won't likely find much information about how much other people have paid for them in the past, which is the only real guide to what you might get for them today. If you can find someone who's been lusting after a pair since he was a teenager, you might get a pretty good price. Absent that, they're larger and heavier than most players want these days. As for the free guitar, well, free guitars are where you find them. Good luck with that. Just to make sure, we're talking about this cabinet, right? If you're actually talking about this cabinet, then I apologize for getting pretty much everything wrong!